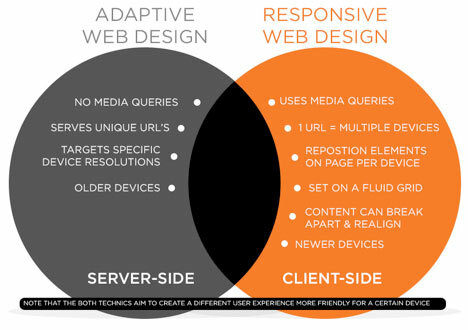 The Best Approach Should You Choose - Adaptive Design OR Responsive Design? The Best Approach Should You Choose – Adaptive Design OR Responsive Design? Home SEO The Best Approach Should You Choose – Adaptive Design OR Responsive Design? One of the hottest topics of discussion among web developers is how to make websites accessible across different mobile devices instead of standard desktop screens. Even though, the concept isn’t new but the approach has changed to cope up with the opportunities ahead. Put it simply, the continuous development of new mobile devices, tablets and similar gadgets, making a site compatible to all the latest mobile devices can be challenging for developers. And so, they need to find ways that can help them make their web design suited for mobile. Nowadays, most of the sites that can be viewed on mobile devices are usually built using the responsive web design (RWD) or adaptive web design (AWD) methods. Both of these methods hold the capability that makes a site work properly, when accessed via mobile devices. Remember that users who access your site on a mobile device or any other display screens are not concerned with what method you use to make your site viewable across distinct display screens. What users want is that they can navigate throughout the site in a smooth and effective manner. And so, it is imperative for developers to understand which method better suits their needs. If you’re having issues deciding whether you should use responsive design or adaptive design method to make your site render appropriately on mobile devices, then continue reading this post further to get an answer to your question. The term RWD was coined by Ethan Marcotte in 2010, and has today become one of the most talked-about and extensively used approach for making a website design suitable for mobile use. Responsive design is, basically, aimed at creating sites that can adapt and adjust automatically according to the display screen they are being accessed on. Thus, irrespective of whatever device your user might be using to view your site, having a responsive layout will ensure to render enhanced viewing experience – with or without any need to scale the design to fit any particular device screen. Any website that is designed using the RWD approach adapts to the device viewport, by making use of fluid grids, flexible images and media queries. Essentially, a responsive design resizes and reorganize all of the website elements to fit the browser size. The phrase Adaptive Web Design was coined by Aaron Gustafso in 2011. When it comes to designing a site using the AWD approach, not just a single page change to fit any device size or screen, rather many different layouts are being created for various screen sizes. This approach is based on progressive enhancement (PE), and adapts a web design to a device by uploading any predefined set of layout – be it for a Smartphone, tablets, laptops or desktops. In essence, whenever a user visits your site a pre-built layout gets uploaded according to the detected device – that the use use to access the website. You just need to have familiarity with HTML and CSS technologies to design a website using the responsive web design approach. Since the majority of designers and developers usually have a basic understanding of both these technologies, it becomes easy to work with a responsive design. However, when creating a responsive layout you need to rely upon media queries, flexible and fluid grids. Since RWD requires such implementation strategies and requires writing a lot of code, working on a responsive design can give you a hard time. You just need to use one single template for making your website accessible across all the devices using a responsive design. Besides, you will only have to make changes to only one stylesheet to make your site adjust to varied screen sizes and resolutions. And thus, creating a mobile-friendly site using the RWD approach takes less development time. On the other hand, the AWD approach takes a lot of time, as you need to design a new template for each device separately. Since responsive design adapts to a device screen automatically, it will work on any device, including the newly developed devices as well. However, adaptive screens will only work for the pre-built screens and might not work for all the screen sizes. This means that adaptive design scores less than responsive design in terms of flexibility. 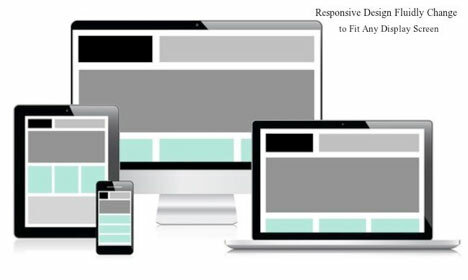 Responsive design requires using only single template that fluidly change to fit the device window that is used to view your website. And so, you just need to make modifications to only a single template to make the changes visible regardless of the device used. But modifying an adaptive design can be strenuous and time consuming, as you will have to make changes to multiple templates that you have designed. The use of responsive web design is increasing and is not going to abate anytime soon. 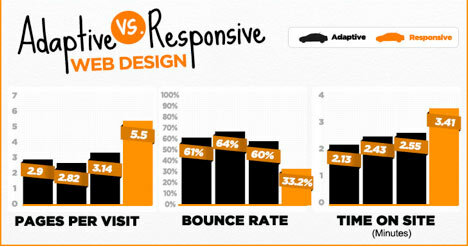 In fact, several website owners have already adopted the RWD approach to make their site optimized for mobile users. However, there are only a few that favors using the adaptive technique and its approaches. While it’s true that responsive design proves a better approach compared to adaptive approach in many aspects, but considering that the adaptive design hasn’t died out despite growing use of responsive design, you can’t neglect using the latter. However, make sure to carefully evaluate your needs and choose the one approach that better suits your project needs.